Installing the angle bracket in the wall to hang something which can make the mess in orderly;It can also save space in a limited roomage and makes the house look more tidy. A simple design to insure the brackets will look great in every living room, office, kitchen, bathroom, or children's room. Wide sturdy and ready for heavy load while keeping their elegant look. Suitable for many different shelve types: book shelves, in/outdoor shelves, garden shelves and many more. Different size of each bracket side to keep it proportional to a small or big shelve. Special welding technique with a slick and smooth finish that also gains extra strength. ❤ Package Includes:2 x Brackets,Easy to install,strong and durable,(WOOD NOT INCLUDED). ❤ Sturdy and durable,Triangle shape is the sturdiest construction in wall brackets currently. ❤ Enough to be used as Bookshelf,Exhibition Stand,potted plants,External Wall Brackets and other household items. 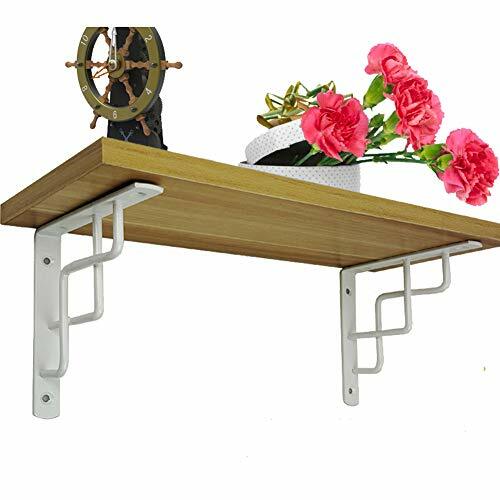 ❤ Simple and elegant multifunctional design that could compliment your living room, bed room, children's room, or kitchen,you can use and re-use our brackets anywhere you want. ❤ Whether you are a home or business owner, contractor, carpenter or DIY'er, you can easily put our metal shelf brackets up in minutes. If you have any questions about this product by Wgwioo, contact us by completing and submitting the form below. If you are looking for a specif part number, please include it with your message.